Its a wet and windy start to April here, not April showers, but more like April falling sideways cold needles. Makes me want to hunker down with a nice wood fire. 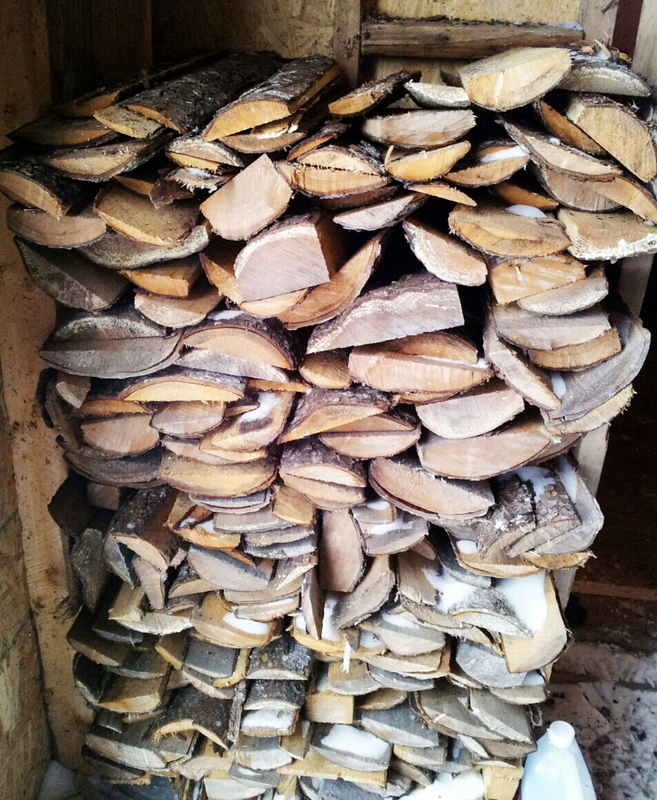 I wrote before about the old wood stove, and how it was such a cosy part of home. Well today I’m reminded of getting the thing lit, while we were bivvering with the cold, especially if it was a fire at the cabin. To start a fire of course you need gas… um I mean you need kindling. 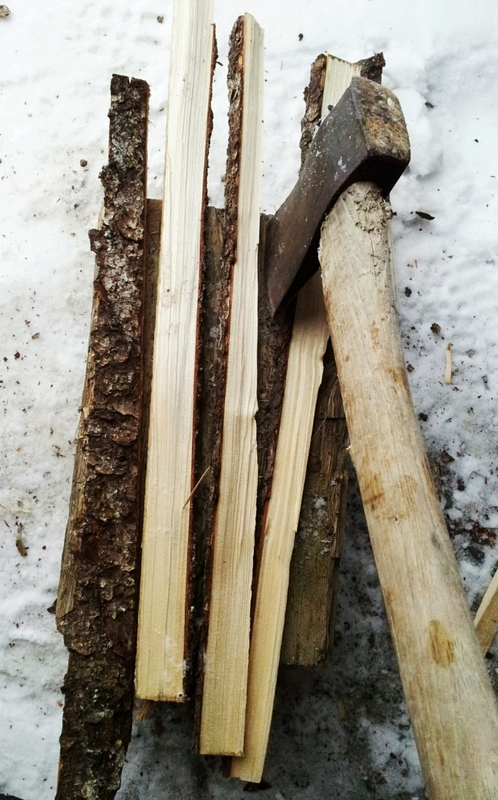 To us Newfoundlanders tho kindling is a foreign word, what you really need is splits. Part of the evening chores of bringing in a wood box of wood, also included filling a split box full of splits. What are splits? Well they are slabs that have been cleaved on a chopping block. And what are slabs you may ask? Well slabs are the sides of wood left over from when a log has been sawed into lumber at a mill. We’d buy them by the pickup load from the local mill if you didn’t have a mill of your own, and they’d be used as part of your winter wood supply, great for getting a bit of heat in a hurry. Everyone had a big old log or stump in their woodhouse to cleave slabs, or split wood on. We’d lay a slab down on it, or perhaps prop it up against it and chop an axe down through till we had some splits about an inch or two wide with nice jaggly edges to catch easily when put in the stove with some old newspaper or catalog pages. Also unfortunately, many a foot or hand has been cut with someone being a little too careless with the old axe, luckily I never was, tho I did catch the toe of my steel nosed boot once. Anyway on a April sideways wet needle rain kinda day, a load of slabs keeping a wood fire going would be a welcome way to warm my cold feet. Good Friday Trouting We don’t want no stinkin Kool-Aid! I just discovered your writings and there bringing back some memories and reminding me of stuff we still do. A note to this post is “maken shavens”. That is where you take a split and cut part of it with a knife to make a feathered look to it. You light the split its self and eliminates the paper. If i think about it ill make you one and send a picture to go with the others. Yeah I forgot about those, we also used to gather them from the planer at the mill.